Reading Week has arrived, and luckily I only have two papers to write, so I will get those done pronto and then spend the rest of the time relaxing. Just have to get a couple of family chores done and then I’ll get right to it. Who knew chores would take up the entire weekend? I really needed to get to work today, but first I visited Peter Collins to brainstorm some ideas for a Christmas beer. Peter had some of his oh-so-good fresh-hopped pale ale on tap, but somehow the keg ran dry as we talked. Luckily I’d had the foresight to bring the last few drops of my Samuel Adams Utopias for Peter to taste. But alas, where did Monday go to? Okay, I had every intention of spending tonight writing my papers. But when we arrived at Rohrbach’s Brewpub for dinner, behold, they were have a special tasting of eight Oktoberfest beers. Well, I could hardly pass up an opportunity for that, could I? The plan was to drive back from Rochester fairly early so I could get to work. Then we happened to round a corner in south Rochester, and there–illuminated as if by a beam of glory from heaven itself–was a store called “Beers of the World”. I knew each of us could take 24 bottles of beer back into Canada without paying duty. But how do you choose only 48 bottles from a store filled with hundreds and hundreds of beers from across the United States and around the world? Needless to say, it took a lot longer than anticipated. More chores. Sweep the leaves off the deck. Off to Canadian Tire for some parts. Catalogue the beer I brought home and see how much would fit in the beer fridge. Plan what beers I would taste at Cask Days. Wait, where did the day go? Cask Days! Although nominally an outdoor event, it felt more like we were indoors, or perhaps most of the way indoors, since the new venue for this 100+ cask event was a large metal barn with one wall missing. Good thing we had a roof over our heads, since it was pouring rain–a harbinger of the oncoming Hurricane Sandy. First up was a brewers’ breakfast–good food, and a great opportunity to meet some of the creative craft brewers of Ontario. Last day of Reading Week. Must write papers. Taking painkillers. Going back to bed. Brewmaster students sometimes get a chance to be a bit creative outside the college–but frequently you have to be flexible with regards to time–and sleep. Earlier this week, I got a text message from my summertime brewery: would I be willing to come in early on Saturday morning to brew up a special beer of my choice on their pilot system for the upcoming Cask Days festival? 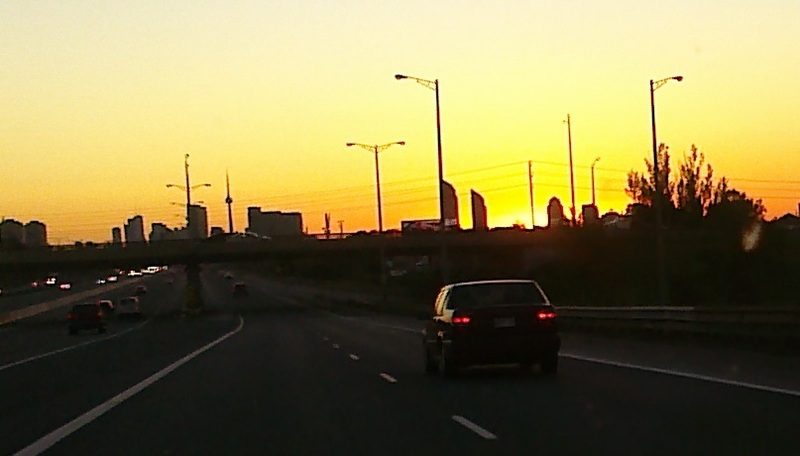 Saturday sunrise over Toronto: Hey, there’s no rush hour! Well, yes I would. So it was that well before the sun arose, I was heading into Toronto, trying to get my brain going with a large double double. On the plus side: no rush-hour traffic on a Saturday morning. Two weeks ago in Sensory Evaluation, Chef Olson had showed us a chipotle pepper that he had created by smoking/dehydrating a jalapeño pepper. Since then, the idea of brewing a spicy chipotle beer had been at the back of my mind. I was thinking of using a dark porter or stout as a base–smoked porters are all the rage in some places–but I didn’t want the roasted barley notes of the porter to overwhelm the smokiness of the chipotles. Hmmm. A black lager (known in Germany as ein schwarzbier) is noted for having no roasty notes. Hmmm. Okay, let’s go with the black lager. So it was that I arrived at the brewery in the cold light of dawn clutching what was left of my large doube double and 500 grams of Black Prinz malt–a malted barley that is designed to add dark colour to a beer without adding any roasty, chocolate or coffee notes. The brew went well, and boy, was it black. Dark black coffee black. Alas, the specific gravity was a bit lower than expected–I’ll have to check my recipe on Monday in Brewhouse Calculations. But it was black. Adding lager yeast to the wort made it, by definition, a black lager. Next step while the lager is fermenting is to buy some jalapeño peppers. Oh, and find a smoker. And find out how to use the smoker. And smoke the jalapeños. And then doubtless buy a second batch of jalapeños. And then smoke them properly the second time around. Cask Days in Toronto this past weekend was not an official part of the college curriculum, but it was all about beer and it was educational, so I considered it an optional but highly recommended extension of the course. 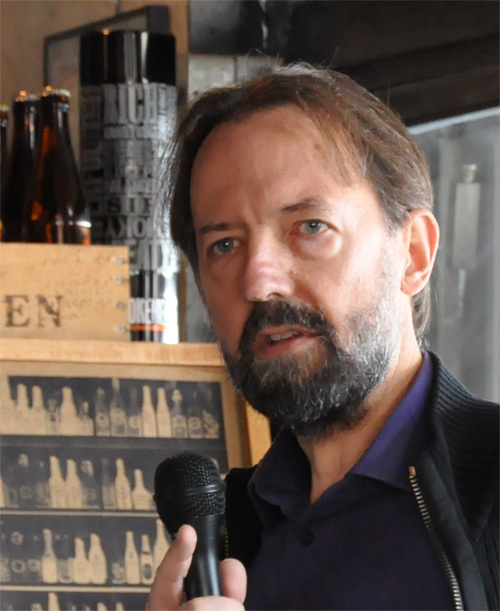 First up on Saturday were three lectures at bar Volo about cask-conditioned ale. Kudos to Cask Days for offering Niagara College brewmaster students a student rate on lecture tickets. The first lecture, “Brewing Cask Ale”, was delivered by Charles MacLean, “Mr. Cask Ale” of Ontario, and the brewmaster for Wellington County Brewing back in 1985. You could spot the Brewmaster students during Charles’s lecture–they were the ones taking copious notes about temperatures, times, grains, and hops. Charles brought up the interesting fact that northern English drinkers like a bit of head on their cask ale, so the cask is often primed with a bit of fermentable sugar (so that the yeast produces more CO2), and a “sparkler” is added to the tip of the dispensing tap, acting like a tiny garden sprinkler that sprays the beer into the glass to produce more of a head. Apparently in the south of England, most drinkers believe the extra carbonation interferes with the taste of the beer, so the casks aren’t primed and a sparkler is not used to dispense the beer. Charles, being trained in the south of England, does not prime his casks. An added bonus feature of the lecture was a glass of Charles’s British-style IPA, dry-hopped with Fuggles. I wept with joy at the taste. Next up were George Millebrandt of C’est What and Ralph Morana of bar Volo, speaking about “Cellaring and Serving Cask Ales”. Traditionally, the brewer fills up the cask while it is standing on end, then hammers a bung, called a keystone, into the hole in the end of the cask to seal it for transportation. The casks are transported while standing upright, and then are laid on their sides behind bar and allowed to settle. When it is time to tap the cask, a tap is driven through the keystone, and beer can then flow out when the tap is opened. Alternatively, if the beer is being stored in another room, a hose is attached to the tap, and a hand pump at the bar, called a beer engine, pulls the beer out. However, neither George and Ralph lay the casks on their sides. 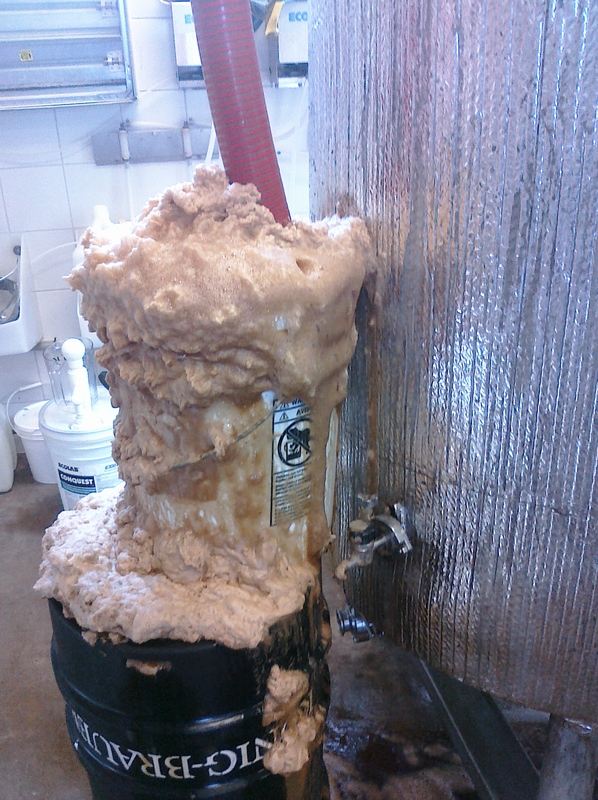 Instead, they leave them standing on end, although they employ different methods to get the beer out. George (C’est What?) uses a long metal tube that is hammered through the keystone, and then slid down into the cask until it is almost at the bottom. A hose from the hand pump is attached to the projecting end of the metal tube, and the cask is ready to be served. However, the end of the metal tube is drawing beer from near the bottom of the cask, so yeast and hop sediment from the bottom of the cask can be pulled up along with the beer. Ralph (bar Volo) uses a new device called a “Cask Widge“. This plastic device is also hammered through the keystone while the cask is still upright, but then a slim flexible plastic tube is slid through the Cask Widge and down into the beer. The plastic tube has floats at the end and mesh-covered holes just below that. When slid into the beer, the floaty-end of the tube curves up and bobs at the surface, with the mesh opening just below the surface. This way, the clearest beer at the surface is always drawn. When you start drawing sludgy beer, you know the level of beer has fallen into the sludge zone and the cask is finished. There was a lot of interest in the Cask Widge at the end of the lecture, and a lot of questions asked about it as a sample was passed around. George trained in the north of England, and Ralph in the south, so there was a lot of “open and frank discussion” between them about the merit or heresy of using a sparkler, priming casks, and having a head on a glass of cask ale. While we were listening, we were sampling an English mild that Ralph and George has collaborated on. Yum! Finally, Nick Pashley and Robert Hughey spoke about the history of cask ale in Ontario. Well, that was what they were supposed to talk about. Nick, being a highly entertaining raconteur, took us on a history of cask ale and Nick Pashley. 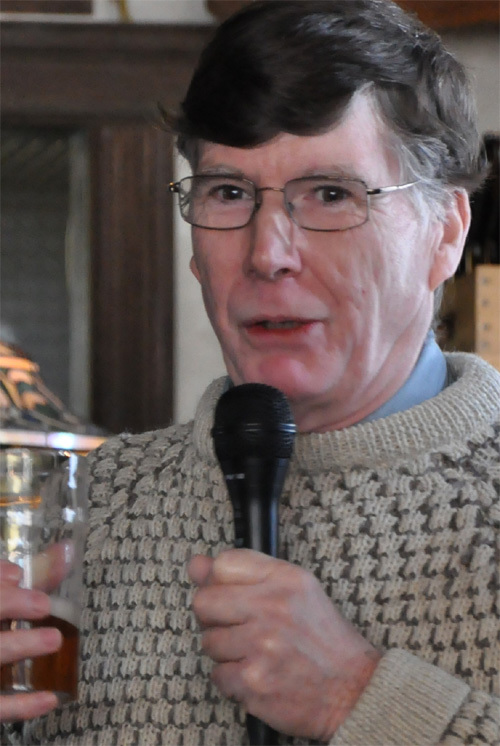 Robert Hughey got us back on topic by recounting the recent history of cask ale in Ontario, starting with Charles MacLean and Wellington County back in 1985. This lecture was accompanied by a golden ale created by Ralph Morana and Nick Pashley. Hopped with Galaxy and then dry-hopped with Galaxy, this was so citrusy, I thought at first that they had added grapefruit juice to the beer. Another beer to cry over, the moreso when it was announced that the cask was empty. After the lectures, it was time for a bit of a social, organized by CASK!, the organization trying to raise awareness of cask ale in Toronto. However, I could only stay for a pint, I had a GO train to catch, and lecture notes to study for Kevin Somerville’s midterm exam on Monday morning (at 8:30 a.m.). On Sunday morning, it was back on the GO train at an unseasonably early hour in order to be at the Brewer’s Breakfast at bar Volo. I met a number of brewers and beer writers, Niagara students and teachers, and also some beer enthusiasts I meet regularly at other beer events. Breakfast was delicious–Scotch eggs, sausage, bacon, fresh bread (including bread baked with dried hops–wow, that will wake you up in the morning)–and to finish, a pint of baltic porter and a toast to the success of Cask Days. Oak-aged Cranberry (Brasserie Dunham, Quebec) — This was my first, and remained my favourite. Imagine biting raw cranberries, with their mouth-sucking tartness. Then add in a sour-milk sourness. It felt like someone had punched me in the mouth. So refreshing! And such a pretty shade of pink, with a beautiful whitest white frothy head. Oak-Aged Baltic Porter (Les Trois Mousquetaires, Quebec) — An incredibly complex strong beer (9.2%), with its notes of chocolate, dark toast, and treacle, all mixed in with sourness, vanilla, bourbon and tannins from the oak. Wow. Blueberry Ale (Pumphouse Brewery, New Brunswick) — Blueberries, start to finish. Not cloyingly sweet, just a refreshing summer ale. Zeitgeist Weissenbock (Flying Monkeys, Barrie) — A fellow first-year student, Sebastian MacIntosh, works at Flying Monkeys, and brewed this up a few weeks ago, although he didn’t know it would be featured at Cask Days. Going by the taste of this dark toasty sweet brew, Sebastian has a bright future ahead of him, and I obviously need to peek over his shoulder during Kevin’s exam. There were more, but you get the idea. Good times, good times. I also served Niagara College beers in our booth for a while, and met several people interested in taking the Brewmaster course. It was good to be able to give them a first-hand account of what the course was like. Eventually though, all good things must end. As much as I wanted to come back for the evening session, and then the after-party at bar Volo, Kevin’s mid-term exam tomorrow morning was ever-present (sort of like a case of athlete’s foot–perhaps not uppermost in your mind, but certainly never far from it either.) So it was one last sample and then back to the books. Business Math test. There were a few head-scratching moments, but overall, I think I got the job done on break-even analysis and simple interest. In Intro to Brewing, more head-scratching moments as Gordo Slater ran through the six main biochemical reactions that a yeast cell completes in order to convert glucose into CO2 and alcohol. I should interject here that in order to be admitted to the brewery program, you need to have either OAC-level (that is, Grade 12) Chemistry or OAC Biology. I took Chemistry and Physics in high school, but not Biology. No problem, the course admission guidelines imply I should be able to get by on Chemistry, right? Back to our story: Gordo drags us through a dense thicket of biological terms. ADP to ATP. Glyceradlehyde. Acetyl Coenzyme A. Pyruvate. Cofactor Mg++. Didn’t understand much. Looks like Biology might have been a better choice than Chemistry. After a short break to let the words ooze through my brain in the hopes that some of the six processes would get stuck in there, we were on to aging and maturation–leaving the beer to sit for a while for a while after the end of fermentation. 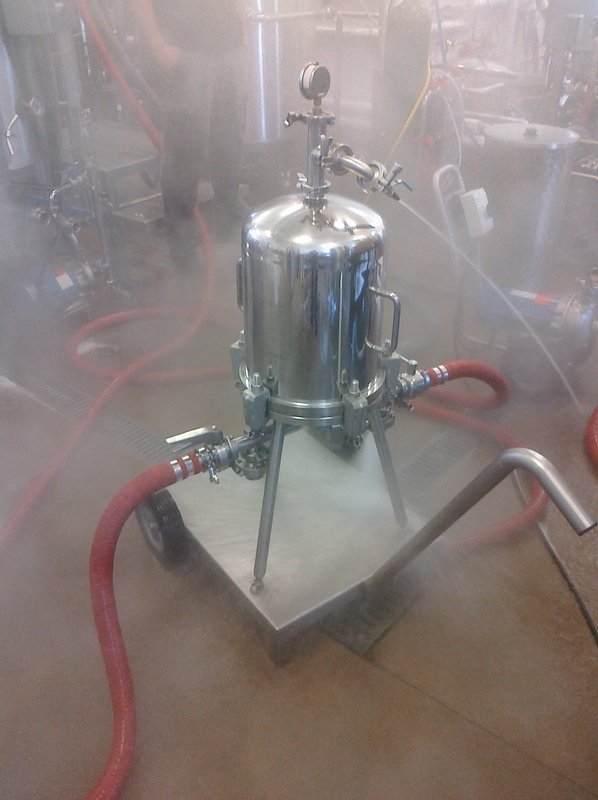 This clarifies, stabilizes, carbonates and standardizes what’s in the fermentation vessel. 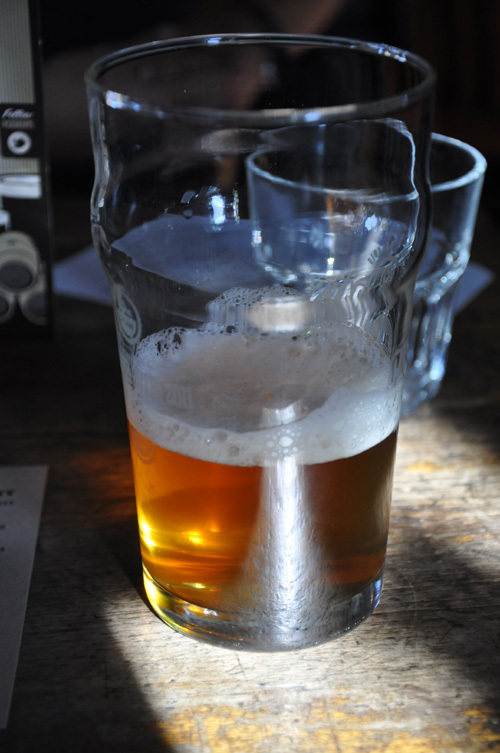 In the final half hour, we hurried through a bit about cask-conditioned ales. I was disappointed that we didn’t spend more time on this, with perhaps more of an introduction to the subject for the students who have not yet been inducted into the brother/sisterhood of real ale. Real ale is becoming more popular in southern Ontario, and brewpubs of the future had better understand what it is and how to serve it properly, so it would seem like a good subject to spend some time exploring. 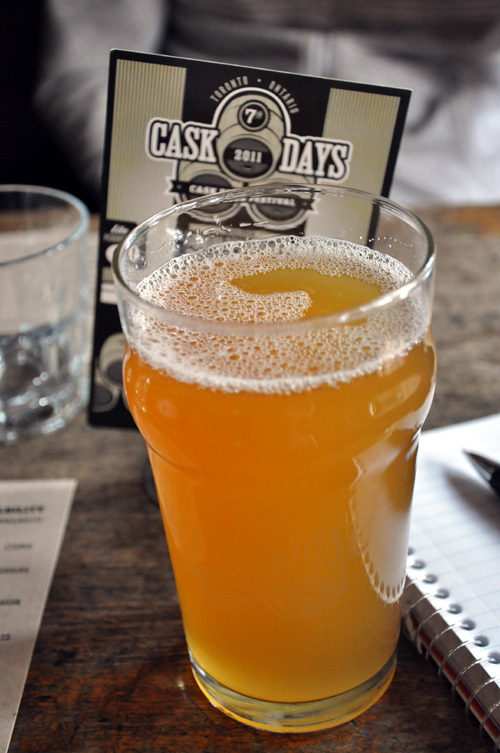 The history of cask ale in Ontario (with Nick Pashley and Robert Hughey). A pint of cask ale is served at each lecture, so my note-taking may decline in quality as the day progresses. And somewhere in there, I have to study for the Ingredients mid-term at–you guessed it–8:30 a.m. on Monday. In Ingredients class today, we finished off the multi-week topic of barley by talking about types of barley (2-row versus 6-row), the various varieties of each, how new varieties are cultivated, and what aspects of barley-ness are sought by barley breeders. Then during a break, Kevin Somerville laid a few licks on us: 1. New group assignment, due in three weeks. 2. Test next week. 3. Mid-term exam in two weeks. Back to work, and the topic of malt competitors–that is, ingredients that can provide soluble starches, enzymes, colour and character in place of malt. We had talked about adjuncts last Friday in Intro to Brewing, but we examined them and other malt competitors a lot more closely here: flaked, flour, grits, torrified, whole cereal, glucose syrup, sucrose, invert sugar, caramel, and malt extract. Then how each of them are prepared, and what equipment we may need in order to use them. For instance, who knew that glucose syrup has to be held at a temperature of 50C or it will solidify? Or that some whole grain cereals have to be gelatinized in a cereal cooker? Or that we may have to use commercially-produced enzymes in the cereal cooker due to higher temperatures that barley’s natural enzymes can’t survive?